This simply wonderful image was taken by the NASA - Dawn Spacecraft on February, 19, 2015, and shows us the so-called "Dwarf-Planet" 1-Ceres from a distance of nearly 29.000 miles (such as approx. 46.670,86 Km). Here, we can (finally!) see that the brightest "Spot" (already known) that exists on 1-Ceres, has a Dimmer (---> less bright) Companion, which apparently lies in the same Basin (---> large Impact Crater). What actually are these two "Bright Spots"? Surfacing Frozen Water Ice Pools? True "Flares", whose origin in still unknown? Nobody knows for sure. Now. But in a few days we might know more... 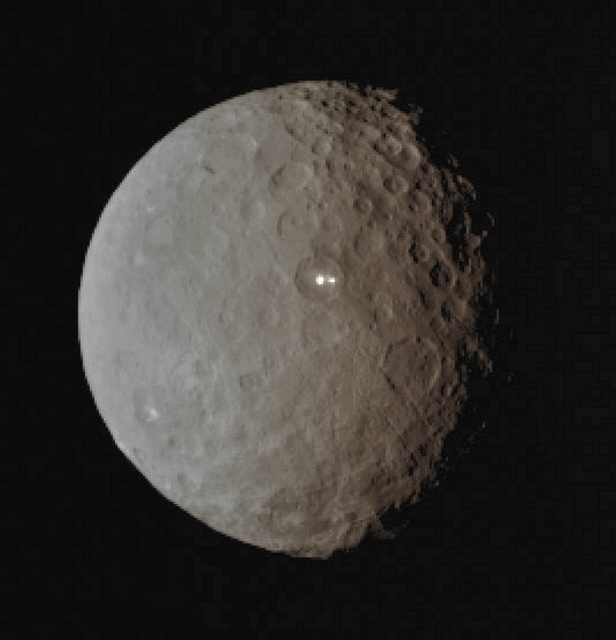 However, the NASA - Dawn Spacecraft is due to be captured into orbit around 1-Ceres on March 6, 2015. This image (which is an Original NASA - Dawn Spacecraft's b/w and NON Map-Projected frame published on the NASA - Planetary Photojournal with the ID n. PIA 19185) has been additionally processed, magnified to aid the visibility of the details, contrast enhanced and sharpened, Gamma corrected and then colorized (according to an educated guess carried out by Dr Paolo C. Fienga-LXTT-IPF) in Absolute Natural Colors (such as the colors that a normal human eye would actually perceive if someone were onboard the NASA - Dawn Spacecraft and then looked down, towards the Surface of 1-Ceres), by using an original technique created - and, in time, dramatically improved - by the Lunar Explorer Italia Team.